原文：In view of the health and environmental effects, would the use of nuclear weapons by a state in war or other armed conflict be a breach of its obligations under international law including the WHO Constitution? 原文：Is the threat or use of nuclear weapons in any circumstances permitted under international law? ^ a b c "Request for Advisory Opinion transmitted to the Court under the United Nations General Assembly resolution 49/75 K of 15 December 1994", p.2. ^ a b c d e f g h i j "Summary of the Advisory Opinion of 8 July 1996", p.94. ^ a b "Request for Advisory Opinion transmitted to the Court under a World Health Assembly resolution of 14 May 1993", p.2. ^ I.C.J. Reports 1996, pp.66-68, para.1. ^ I.C.J. Reports 1996, p.84. para.32. ^ I.C.J. Reports 1996, pp.232-234, para. 11. ^ I.C.J. Reports 1996, p.239, para.24. ^ I.C.J. Reports 1996, p.240, para.26. ^ I.C.J. Reports 1996, pp.241-243, paras.27-33. ^ I.C.J. Reports 1996, p.243, para.34. ^ a b c d I.C.J. Reports 1996, pp.243-244, para.35. ^ I.C.J. Reports 1996, p.244, paras. 38-39. ^ a b I.C.J. Reports 1996, p.245, para.41. ^ a b c I.C.J. Reports 1996, pp. 245-246, paras. 45-46. ^ a b I.C.J. Reports 1996, p.248, para.54. ^ I.C.J. Reports 1996, pp.249-253, paras. 59-63. ^ I.C.J. Reports 1996, pp.253-254. para. 65. ^ I.C.J. Reports 1996, pp.254. para. 66. ^ I.C.J. Reports 1996, pp.254. para. 67. ^ I.C.J. Reports 1996, p.257, para. 78. ^ a b c d e f g h i j I.C.J. Reports 1996, p.265-267, para. 105. ^ I.C.J. Reports 1996, p.227. Request for Advisory Opinion transmitted to the Court under a World Health Assembly resolution of 14 May 1993. http://www.icj-cij.org/files/case-related/93/7648.pdf. 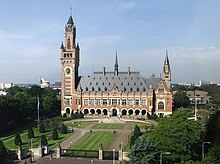 Request for Advisory Opinion transmitted to the Court under the United Nations General Assembly resolution 49/75 K of 15 December 1994. http://www.icj-cij.org/files/case-related/95/7646.pdf. “Legality of the Use by a State of Nuclear Weapons in Armed Conflict, Advisory Opinion”. I.C.J. Reports 1996: p.66. http://www.icj-cij.org/files/case-related/93/093-19960708-ADV-01-00-BI.pdf. “Legality of the Threat or Use of Nuclear Weapons, Advisory Opinion”. I.C.J. Reports 1996: p.226. http://www.icj-cij.org/files/case-related/95/095-19960708-ADV-01-00-BI.pdf.